Ennemond-Alexandre (in Italy Edmondo Alessandro) Petitot, French architect, draughtsman and designer, active in Italy. He was educated in Lyon and subsequently (1741) entered the architectural studio of Jacques-Germain Soufflot. On Soufflot s advice he moved to Paris a few months later in order to follow a course at the Acadmie Royale d Architecture; he won the Grand Prix there in 1745. The following year he went to Rome, where he became friendly with Comte Joseph-Marie Vien, through whom he made the acquaintance of Giovanni Battista Piranesi. The four years Petitot spent in Rome, studying and copying antiquities and various modern monuments, were of great importance in his artistic development. After returning to Paris with Vien in 1750, he worked on the decoration of several great houses and built the d Hancourt Chapel in Notre-Dame Cathedral. He also engraved some plates for the Recueil d Antiquits by Caylus, who introduced him to Guillaume Du Tillot, Inspector of Ducal Buildings in the Duchy of Parma (and Prime Minister since 1759), who invited him to become Court Architect to Philip, Duke of Parma (reg 1748-65). He accepted, and left France for Italy. On his arrival in the Duchy (1753), Petitot was immediately entrusted with the project of remodelling the ducal summer residence in Colorno. There he continued building the Venerie Royale (1753-56), in which he was greatly influenced by Soufflot s plan for the Hôtel Dieu in Lyon, and decorated the ducal apartments, for example the Great Hall (1754-56). In the gardens, which he replanned, he rebuilt the Great Stairway (1757-8), designed pedestals for two colossal Roman statues (1757) and constructed the New Garden (1754-57). In the same period he planned a new Royal Chapel for Colorno (not executed), employing motifs taken from the chapel at Versailles, but varying them structurally with an interpenetration of schemes based on the Greek and Latin crosses. In the 1760s he worked on the restructuring of the Nobles Lodge in the Reserve Palace, as well as on the High Road, studies on aqueducts, plans for reconstruction of Palazzo Ducale, restructuring of Palazzo del Giardino and the Ministry building and Palatine Library. In 1769 he organized the festivities and decorations for the marriage of Duke Ferdinand of Bourbon with Maria Amalia of Hapsburg. 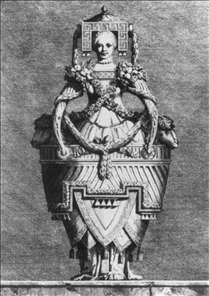 In 1771 he designed the series of ten tables entitled Mascarade à la Grecque. After the fall of Minister Du Tillot, Petitot left to his students the performance of the court commissions, but continued his participation in the activities of the Academy. He died in Parma in 1801. See more details about "Greek Masquerade: The Bride"